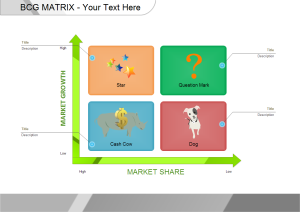 An easy matrix maker that helps make matrix and charts with free templates. Quickly and easily create matrix and many other diagram types in minutes. 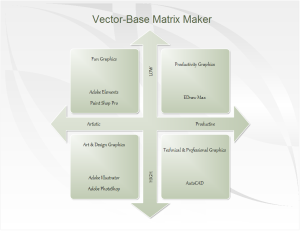 Discover why Edraw is the most superior matrix maker: Download it Now. 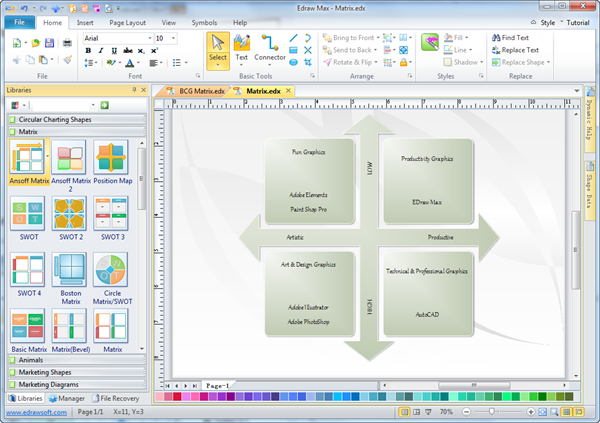 Edraw Matrix maker can be used to visually represent SWOT matrix, Ansoff matrix, feature comparison matrix, prioritization matrix, competitive strategies matrix, six markets model matrix and more. It is designed for users of all abilities. For those already accustomed with other Microsoft apps such as Word or Excel, the interface will be pretty familiar. Simply drag and drop symbols, apply built-in designed themes, and automatically share your finished matrix into a presentation or PDF with one click. Vector built-in symbols allow even build professional-looking matrixes. 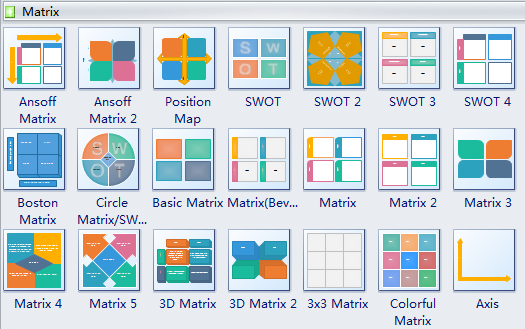 The stencils library "Business Matrix" contains 21 matrix symbols and some marketing diagram components. 3D symbols are also available for lifelike and personalized diagram creation. Drag and drop interface and auto formatting tools greatly simplify the whole process. Four types of business matrix examples can be found in Edraw (in the business diagram category), namely Product Matrix, BCG Matrix, SWOT Matrix and Ansoff Matrix. Each type of matrix contains various styles of shapes to meet different users need. Several 3D shapes are also included. What is more, you can change the shape style anytime you want by clicking "Replace Shape" tab (on "Home" menu, in the "Replace" group). To offer you easier operation and better results, a vector matrix example is presented so that you can download it for your own designs anytime. A BCG matrix example is used for determining a business product' priority portfolio. Here is a ready-made template in editable vector format. 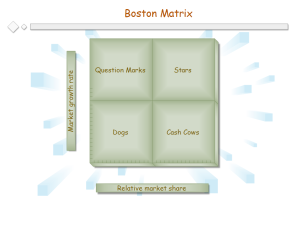 A Boston matrix example helps organizations figure out which areas of their business deserve more resources and investment. Try this template to make a desired one.